Since the introduction of medium-chain acyl coenzyme A dehydrogenase (MCAD) deficiency in population newborn bloodspot screening (NBS) programs, subjects have been identified with variant ACADM (gene encoding MCAD enzyme) genotypes that have never been identified in clinically ascertained patients. It could be hypothesised that residual MCAD enzyme activity can contribute in risk stratification of subjects with variant ACADM genotypes. We performed a retrospective cohort study of all patients identified upon population NBS for MCAD deficiency in the Netherlands between 2007–2010. Clinical, molecular, and enzymatic data were integrated. Eighty-four patients from 76 families were identified. Twenty-two percent of the subjects had a variant ACADM genotype. In patients with classical ACADM genotypes, residual MCAD enzyme activity was significantly lower (median 0%, range 0-8%) when compared to subjects with variant ACADM genotypes (range 0-63%; 4 cases with 0%, remainder 20-63%). Patients with (fatal) neonatal presentations before diagnosis displayed residual MCAD enzyme activities <1%. After diagnosis and initiation of treatment, residual MCAD enzyme activities <10% were associated with an increased risk of hypoglycaemia and carnitine supplementation. The prevalence of MCAD deficiency upon screening was 1/8,750 (95% CI 1/7,210–1/11,130). Determination of residual MCAD enzyme activity improves our understanding of variant ACADM genotypes and may contribute to risk stratification. Subjects with variant ACADM genotypes and residual MCAD enzyme activities <10% should be considered to have the same risks as patients with classical ACADM genotypes. Parental instructions and an emergency regimen will remain principles of the treatment in any type of MCAD deficiency, as the effect of intercurrent illness on residual MCAD enzyme activity remains uncertain. There are, however, arguments in favour of abandoning the general advice to avoid prolonged fasting in subjects with variant ACADM genotypes and >10% residual MCAD enzyme activity. Medium-chain acyl-Coenzyme A dehydrogenase (MCAD [E.C.1.3.99.3]) deficiency (OMIM 201450) is the most common inherited disorder of mitochondrial fatty acid oxidation. The MCAD enzyme is responsible for the first step in the mitochondrial β-oxidation of CoA esters of medium-chain length fatty acids. Before the introduction of population newborn bloodspot screening (NBS) for MCAD deficiency, patients presented clinically during periods of catabolic stress, precipitating acute symptoms[2, 3]. Some patients developed seizures, coma or even presented with sudden death, associated with hypoketotic hypoglycaemia. However, asymptomatic family members have also been recognized with the same disease-causing genotype. Worldwide, approximately 80% of clinically presenting patients were homozygous for the c.985A>G missense mutation in the ACADM gene enco-ding the MCAD enzyme. Early diagnosis significantly improves the outcome and treatment is mainly dietary, consisting of avoidance of prolonged fasting and an emergency regimen during intercurrent illness. Secondary free carnitine (C0) deficiency in blood may be corrected by carnitine supplementation in some patients, but evidence for this treatment is limited. Since the introduction of the NBS programs, newborns are identified by the detection of increased concentrations of medium-chain length acylcarnitines and their ratios. An elevated concentration of octanoylcarnitine (C8:0) is the most common biomarker for MCAD deficiency. Besides patients with classical ACADM genotypes, NBS identifies subjects with hyperoctanoylcarnitinaemia and variant ACADM genotypes, i.e. genotypes that have not been recognized before in clinically ascertained patients. As population NBS programs aim to prevent development of a phenotype, physicians feel forced to institute treatment, independent of the genotype. It can be questioned, however, whether subjects with variant ACADM genotypes have the same clinical risks compared to patients with classical ACADM genotypes. Or even, whether they should be regarded patients at all. Different studies used laboratory parameters to estimate the significance of variant ACADM genotypes[10–14]. Clinical follow-up parameters are difficult to interpret, because early diagnosis and treatment influence the natural clinical course of subjects with variant ACADM genotypes. It could be hypothesised that residual MCAD enzyme activity is a prognostic parameter in risk stratification of patients with variant ACADM genotypes. Therefore, we performed a cohort study integrating NBS test results, molecular studies, and clinical data with enzymatic data of all patients from the Dutch birth cohorts 2007–2010 identified in the population NBS program for MCAD deficiency. The results from subjects with variant ACADM genotypes were stratified, using data from patients with classical ACADM genotypes as a reference. The Medical Ethical Committee of the University Medical Centre Groningen approved the study (METc 2011/133). Parents provided written informed consent. In The Netherlands, the epidemiology and natural history of MCAD deficiency have been well characterised before introduction of the population NBS program in 2007[2, 4, 15]. In our country, 99.75% of all newborns are screened between 72 and 168 h after birth (http://www.rivm.nl). In dried blood spots the following parameters are determined: concentrations of C0, C8:0, and decanoylcarnitine (C10:0), and the C8:0/C10:0 ratio. For MCAD deficiency, the decision is based on the C8:0 concentration only as clinical and laboratory follow-up is initiated in newborns with C8:0 ≥ 0.50 μmol/l within 24 h.
After an initial positive NBS test for MCAD deficiency, the newborns are referred to a metabolic centre. Laboratory follow-up includes a complete acylcarnitine profile in plasma and/or a dried blood spot by tandem mass-spectrometry, and urinary organic acid analysis using gas chromatography–mass spectrometry, as described by Derks et al.. Determination of MCAD enzyme activity is performed in leukocytes or lymphocytes, with an HPLC-based assay using 3-phenylpropionyl-CoA (PP-CoA) as a substrate[9, 16]. 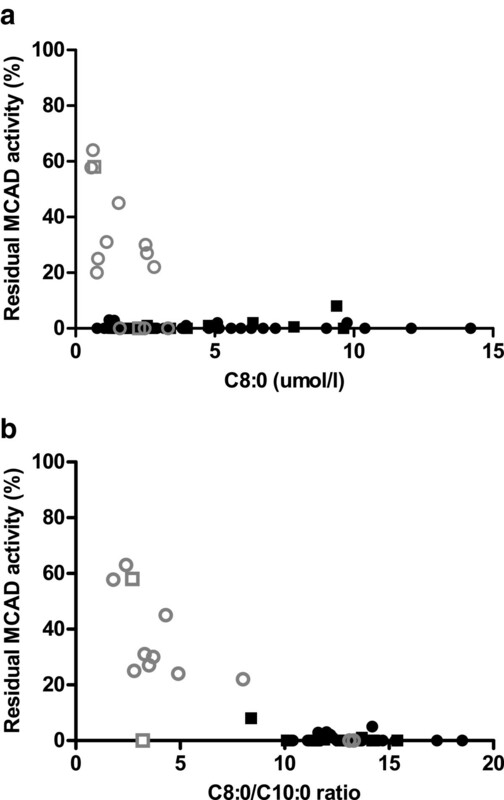 Residual MCAD enzyme activities are expressed as percentage from healthy controls. Analysis of the ACADM gene (OMIM 607008) is performed by sequencing all exons and adjacent intron regions. The nucleotide numbering starts from the first adenine of the ATG translation initiation codon of the ACADM cDNA sequence and amino acid numbering starts from the methionine encoded by this translation initiation codon. The abovementioned analyses are preceded by parental informed consent. A ‘variant ACADM genotype’ was defined as an ACADM genotype that has not been recognized before in clinically ascertained patients in either The Netherlands or in literature. In this study, we included children from the Dutch birth cohorts 2007–2010 with clinical follow-up in a metabolic centre after population NBS for MCAD deficiency. For most children the diagnosis has been confirmed by MCAD enzyme and/or ACADM gene analysis. If these analyses were not performed, the confirmatory acylcarnitine profile was characterised by C8:0 concentrations >50 z-scores (i.e. ≥ 1.65 μmol/l) and a C8:0/C10:0 ratio ≥10 z-scores (i.e. ≥ 8.3) above the threshold for NBS, based on reference data from the National Institute for Public Health and the Environment. Clinical and laboratory data from all patients were retrospectively retrieved from the Dutch Diagnosis Registration Metabolic Diseases database (http://www.ddrmd.nl), and medical and laboratory files by one investigator (CT). Data from the patients in which the diagnosis had been confirmed enzymatically were included in the analysis of the prognostic value of MCAD enzyme analysis. Differences between normally distributed continuous data were analyzed using parametric tests. Data that were not normally distributed were analyzed using nonparametric tests. For dichotomous data, a chi-squared test was used. For analysis of correlations, Spearman’s rank test was used. The significance level was set at p < 0.05. Statistical analyses were performed using GraphPad Prism software (GraphPad Software Inc., version 5.00, 2007). In the period 2007–2010, the diagnosis MCAD deficiency was confirmed in 84 patients, after 108 initial positive screening results for C8:0 ≥ 0.50 μmol/l. Data from the NBS test, molecular studies and clinical follow-up were compared to the residual MCAD enzyme activity, in order to determine the prognostic value. Results from patients with a classical ACADM genotype were used as a reference. ACADM genotypes were available from 68 of the 84 patients (Table1). Homozygosity for the common c.985A > G mutation was observed in 62% (42/68), the c.985A > G allele frequency was 77% (104/136). Variant ACADM genotypes were observed in 22% (15/68). Data on residual MCAD enzyme activity could be obtained from 64 of the 84 patients. Median residual MCAD enzyme activity in patients with classical ACADM genotypes was 0% (range 0-8% and 0-5% in leukocytes and lymphocytes, respectively). Subjects with variant ACADM genotypes displayed significantly higher MCAD residual enzyme activities (median 25%, range 0-63%, Mann–Whitney U test, p < 0.01) (Figure1). A, measured in leukocytes; B, measured in lymphocytes; n.d., not determined. Median residual MCAD enzyme activities are depicted. 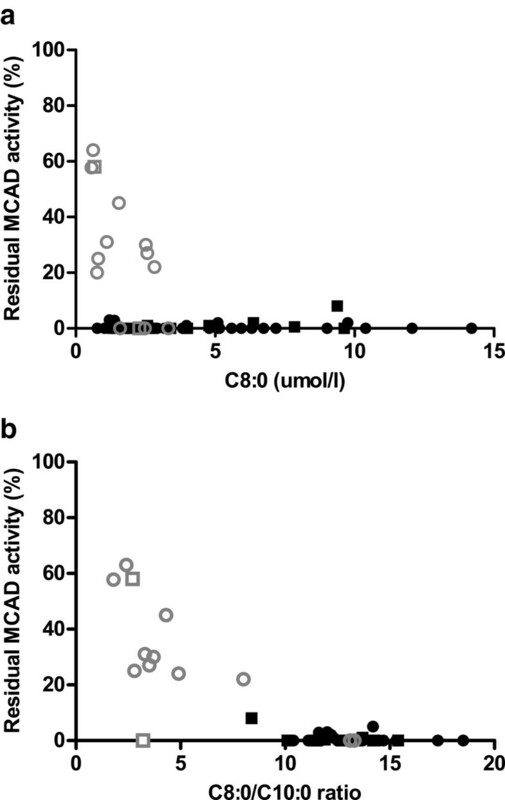 Residual MCAD enzyme activities measured in leukocytes, and lymphocytes. Legend: Residual MCAD enzyme activities measured in leukocytes (A), and lymphocytes (B) from true positives with variant ACADM genotypes (squares) and classical ACADM genotypes (dots). For further comparison of groups, patients were stratified based on residual MCAD enzyme activity. A threshold of 10% was considered practical and safe, because the highest residual MCAD enzyme activity determined in a patient with a classical ACADM genotype was 8%. Figure2a demonstrates that C8:0 concentrations were significantly higher in patients with residual MCAD enzyme activities <10% than in subjects with residual MCAD enzyme activities ≥10% (median 3.96, range 0.77–14.80 μmol/l vs. median 1.11, range 0.56– 2.82 μmol/l, respectively, Mann–Whitney U test, p < 0.01). Additionally, C8:0/C10:0 ratios were significantly higher in the group of patients with residual MCAD enzyme activities <10% (median 13.00, range 3.21–18.50), when compared to the group of subjects with residual MCAD enzyme activities ≥10% (median 3.41, range 1.81–8.03, Mann–Whitney U test, p < 0.01). 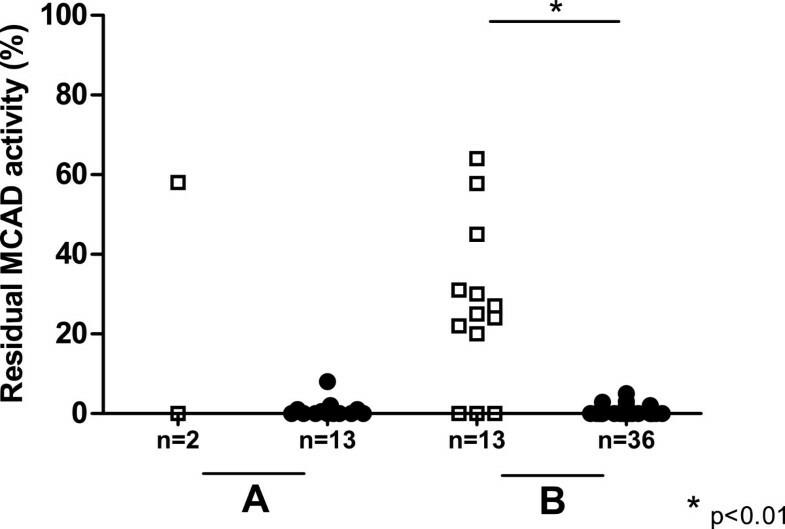 A strong negative linear correlation was found between the NBS C8:0/C10:0 ratio and the residual MCAD enzyme activity measured in lymphocytes (Spearman r = −0.67, p < 0.001) (Figure2b). Relationship between residual MCAD enzyme activity and C8:0 and C8:0/C10:0 ratio upon NBS. Legend: Classical ACADM genotypes depicted in black, variant ACADM genotypes in grey. Squares: measured in leukocytes; Circles: measured in lymphocytes. Seven newborns had a clinical presentation in the neonatal period before diagnosis (Table2). Two of these newborns died before arrival in the hospital. Five had been admitted to the hospital before NBS test results became available, three of them with documented hypoglycaemia. All newborns with a neonatal presentation had a C8:0/C10:0 ratio ≥10 upon NBS and residual MCAD enzyme activities <1%. Six of these patients had a classical ACADM genotype. The seventh case had the variant c.985A>G/c.216+1G>T genotype, corresponding with 0% residual MCAD enzyme activity. Data were processed as described in ‘Patients and Methods’. Hypoglycaemia was defined as blood glucose concentration <2.6 mmol/L or reported hypoglycaemia in medical charts. * p < 0.05. After the diagnosis was established, no fatal manifestations of MCAD deficiency were reported. Patients with residual MCAD enzyme activities <10% were 1.2 times more frequently admitted to the hospital preventively, compared to subjects with residual MCAD activities ≥10% (Table2). All patients with documented hypoglycaemia had residual MCAD enzyme activities <10%. During follow-up, no carnitine was prescribed for low plasma C0 concentrations in subjects with residual MCAD enzyme activities ≥10%. In contrast, 51% (27/51) of the patients with residual MCAD enzyme activities <10% received carnitine supplementation. Between 2007–2010, 84 patients were identified from 76 families. The prevalence of MCAD deficiency was 1/8,750 (95%CI 1/7,210–1/11,130), which is considered to be a high estimate (Table3). When subjects with residual MCAD activities ≥10% were excluded, the prevalence was 1/10,070 (95%CI 1/8,190-1/13,070). a According to De Vries et al. ; b According to Derks et al. ; c According to CBS; d This study. This is the first report in which residual MCAD enzyme activities in a large cohort of patients identified upon population NBS for MCAD deficiency have been used for risk stratification. Within the group of newborns with hyperoctanoylcarnitinaemia, a broad spectrum of ACADM genotypes has been identified. As the clinical significance of many variant ACADM genotypes is incompletely known, we integrated clinical, molecular and enzymatic data from a well-defined population. Residual MCAD enzyme activity correlated well with ACADM genotype and phenotype, and could therefore aid in the risk stratification of patients after positive NBS test. In this study, residual MCAD enzyme activity was measured with PP-CoA, which is a very specific substrate to determine residual MCAD enzyme activity in vitro[16, 17]. Traditionally, natural substrates such as hexanoyl-CoA and octanoyl-CoA were used to determine MCAD enzyme activity. However, even in patients who were homozygous for the classical c.985A > G ACADM mutation, high residual enzyme activities were found when using these substrates, possibly due to the overlap in substrate specificity with other acyl-CoA dehydrogenases. Therefore, in our country these substrates have been replaced in the confirmatory enzymatic studies after positive NBS test results. However, the possible role of PP-CoA in the pathophysiology of MCAD deficiency is currently unknown and it is important to realise that the pathophysiology is far more complex than just deficient MCAD enzyme activity. Before NBS test results became available, a neonatal presentation occurred in seven patients with residual MCAD enzyme activities <1%. Two of these patients presented with a fatal event. Despite the important benefits of population NBS programs for MCAD deficiency, the question remains justified, whether we detect all patients before clinical presentation and whether they are all patients. When compared to other NBS programs, blood sampling for the NBS test is relatively late in our country, i.e. between 72 and 168 hours of life. However, similar percentages of (fatal) neonatal presentations have been reported in studies from other countries, where the NBS test is performed earlier in the neonatal period. Since several inherited metabolic diseases may present with a fatal neonatal presentation, escaping early detection by population NBS programs, we recommend dried blood spot analysis of acylcarnitines and amino acids in all newborns who die before the NBS test has been performed. In a subset of the children with variant ACADM genotypes, residual MCAD enzyme activity is relatively high (Table1). This raises the question whether these subjects are at risk of developing clinical symptoms as patients with classical genotypes, and should be considered “patients”. If the main arguments for a population NBS program are strictly considered, subjects with variant ACADM genotypes may not be regarded “true-positives”, because their genotypes have not been observed before in clinically ascertained patients. However, some of these mutations may have never been detected due to low carrier frequencies, but may give the same clinical risks as classical ACADM mutations. Already before the introduction of NBS for MCAD deficiency, the term “patient” was a matter of debate. Reduced penetrance of the disorder is a well-recognised phenomenon, reflected by asymptomatic family members with the same classical ACADM genotype as clinically ascertained probands. Moreover, it is recognised that single nucleotide polymorphisms (in combination with a classical ACADM mutation) may contribute to the development of hyperoctanoylcarnitinaemia by modulating mitochondrial fatty acid oxidation. In this study, 15 subjects had a ‘variant ACADM genotype’. Three newborns (with c.985A>G/c.216+1G>T; c.985A>G/c.470C>T and c.233T>C/c.1066A>T genotypes) displayed C8:0/C10:0 ratios >10 and residual MCAD enzyme activity <1% (Figure2b), as observed in patients with classical ACADM genotypes. In our opinion, they should be considered and treated like patients with classical ACADM genotypes. The patient with the c.985A>G/c.928G>A genotype displayed a C8:0/C10:0 ratio <10. Since MCAD enzyme activity was absent, he was considered “patient” like patients with classical ACADM genotypes. In the remaining 11 subjects with variant ACADM genotypes, residual MCAD enzyme activities ranged between 20%–63%. Should they receive (the same) treatment as patients with classical genotypes? In previous studies that aimed to determine risk stratification for subjects with variant ACADM genotypes, different sets of data have been used. Examples include correlation of metabolite concentrations to ACADM genotypes[10, 11], or heterolo-gous overexpression studies to determine the effect of various ACADM mutations on residual MCAD enzyme activity and the thermal stability of the MCAD enzyme[12–14]. In most cases, however, the effect of one single ACADM mutation was studied, although MCAD deficiency is an enzyme deficiency caused by genetic alterations on both ACADM alleles. In this study, classical ACADM genotypes were associated with residual MCAD enzyme activities <10%. Substantial octanoate oxidation and normal ketone body metabo-lism were demonstrated in previous stable isotope studies under normal fasted conditions in patients with classical ACADM genotypes. It is well recognised that clinically ascertained patients tolerated overnight fasting without problems before establishment of the diagnosis, as recently reviewed. Similar observations were made in our country, since overnight fasting per se has never precipitated symptoms in patients[2, 6]. As a subset of subjects with variant ACADM genotypes was associated with a milder biochemical and clinical phenotype, and relatively high residual MCAD enzyme activity, it could be argued that the general advice on avoidance of overnight fasting in subjects with residual MCAD enzyme activities ≥10% can be abandoned. However, the major argument in favour of avoiding prolonged fasting is early anticipation in circumstances of intercurrent illness with fever in young patients. Some (variant) ACADM mutations have shown to lead to temperature sensitive MCAD folding variants in vitro[14, 23]. The clinical in vivo effects remain to be determined. Therefore, an emergency regimen and clinical follow-up remain basic principles of the treatment, regardless of ACADM genotype. The prevalence of MCAD deficiency upon NBS in The Netherlands is threefold higher than found after clinical presentation (Table3), and in line with previous reports. Prior to the introduction of the NBS program, the expected prevalence of MCAD deficiency was calculated to be 1/12,100 (95%CI: 1/8,450–1/18,500) in our country, based on the ACADM c.985A>G carrier frequency in the general population and the assumption of a 94% allele frequency for this common mutation in clinically ascertained cases. The latter was confirmed in patients from the Dutch birth cohorts 1985–1999. The current study displays a more heterogeneous ACADM mutational spectrum with an observed allele frequency of the c.985A>G ACADM mutation of only 77%. Although the observed prevalence is comparable to the expected prevalence, it is important to realize that the availability of molecular tests for the complete ACADM gene has significantly increased since the 1990s. This might have biased identification of patients in our previous studies, hence, causing an underestimation of the expected prevalence. In addition, demographic alterations within the same geographic area might have contributed (http://www.cbs.nl). Population-wide NBS programs identify newborns with hyperoctanoylcarnitinaemia and variant ACADM genotypes. These newborns are currently regarded patients, in whom follow-up and dietary treatment are initiated similarly to the group with classical ACADM genotypes. This study demonstrates the prognostic value of residual MCAD enzyme activity in newborns with hyperoctanoylcarnitinaemia and a variant ACADM genotype. Residual MCAD enzyme activities <10% were associated with clinical symptoms, regardless of ACADM genotype. Clinical symptoms or classical ACADM genotypes have thus far not been reported in subjects with residual MCAD enzyme activities ≥10%. For all positively screened newborns with any form of MCAD deficiency, basic principles of the treatment are parental instructions, cautious clinical follow-up, and application of an emergency regimen. In subjects with variant ACADM genotypes and ≥10% residual MCAD enzyme activities, the necessity to avoid overnight fasting is debatable. The authors gratefully acknowledge JMM Rondeel (Isala Klinieken, Department of Clinical Chemistry, Zwolle, The Netherlands) for help in collecting the NBS test results. M van Rijn (dietician Section of Metabolic Diseases, UMC Groningen, Groningen, The Netherlands) is acknowledged for critically reading an early version of the manuscript and for her suggestions. CML Touw participated in data collection, analysis and interpretation, generation of the figures, in writing of the manuscript, and approved of the final version. GPA Smit conceived the study, participated in writing the manuscript, and approved the final version. M de Vries, JBC de Klerk, AM Bosch, G Visser, MF Mulder, ME Rubio-Gozalbo, KE Niezen-Koning, B Elvers, RJA Wanders, and HR Waterham participated in data collection, and approved of the final version. DJ Reijngoud conceived the study, participated in writing the manuscript, and approved of the final version. TGJ Derks conceived the study, participated in analysis and interpretation of the data, in writing of the manuscript, and approved of the final version.